Back-arc extension is the cause of much of the rifting in the Antarctic Plate Region. 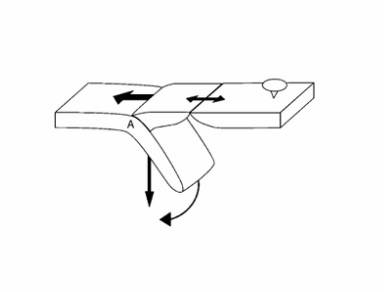 Back-arc extension occurs in the area behind a subduction zone, related to the motion of the subducting slab relative to the overlying plate. According to Heuret and Lallemand (2005), there are several causes of this type of extension. The first is relative motion of the overlying plate away from the subduction zone, where a slab is effectively anchored in place by restrictive forces in the mantle. 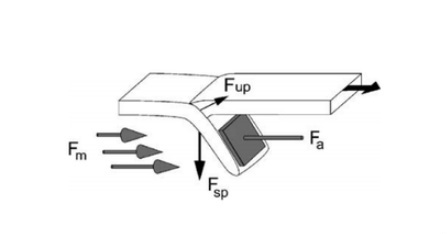 This figure from Heuret and Lallemand (2005) portrays the spreading of an overlying plate from a subduction zone, where a plate is fixed by deep mantle forces (Fa). In (a), mantle push induces extension in the back-arc, while in (b), mantle push induces compression. A prominent back-arc spreading center is the East Scotia Ridge, which is behind a subduction zone to its East, where the South American Plate is dipping beneath the Sandwich Plate at a rate of about 70-85 km/Myr (Leat et al., 2000). Extension here may be entirely caused by slab rollback, depending on whether or not the asthenosphere is pushing against the slab from the west or from the east (Leat et al., 2000). 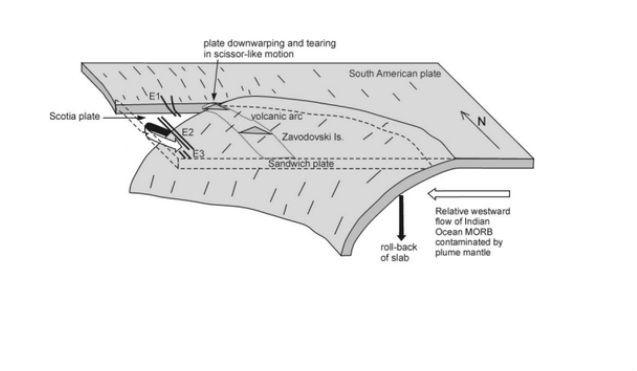 Figure from Leat et al., (2000), showing the subduction of the South American Plate beneath the Sandwich Plate, including rollback of the subducting slab. A region of more minor extension is occurring in the Bransfield Basin off the West coast of the Antarctic Peninsula. Unlike at the East Scotia ridge, there is no active seafloor spreading associated with the extension; the old Phoenix slab is pinned in place in the South Shetland trench, and rollback of this slab in addition to relative motions of the Antarctic and Scotia plates is causing tensional forces in the back-arc. These result in some volcanic activity in the basin (Lawver et al., 1996). 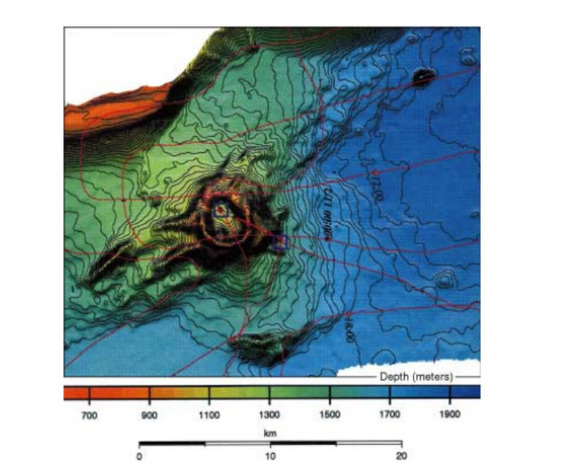 Depiction of the Bransfield Basin from Lawver et al. (1996); the South Shetland Shelf is in the top left corner. There is a rather conspicuous volcano in the center of the image. Arguably the most interesting extensional feature of the Antarctic region is the West Antarctic Rift System (WARS). The WARS is an extensive area, comparable in size to the Basin and Range region in the Western U.S (Huerta and Harry, 2007). There is also similar geochemistry of magmas over the region, suggesting a relatively homogeneous, widespread source like a plume, or perhaps a re-melted fossil plume (Rocchi et al, 2002). The plume hypothesis has been given credence due to the fact that there appear to be two phases of dissimilar rifting in the area. The first occurred from about 105 – 65 Ma as a result of extensional forces when the ancient Phoenix plate stopped subducting beneath the Antarctic Plate (i.e. back-arc extension) (Huerta and Harry, 2007). The second phase was focused in a narrow region close to East Antarctica, in the Victoria Land Basin, eventually creating the Terror Rift. A mantle plume has been proposed as the cause of this second-phase rifting (Huerta and Harry, 2007). However, Huerta and Harry (2007) have proposed a model with one continuous process. As the crust extends and thins, heat production is less intense in the crust closer to the ancient subduction zone, and this crust becomes more rigid. Heat flow then becomes focused in the warmest regions closer to the East Antarctic Plate, creating more intensified, narrow rifting, giving the appearance of a second phase. Rocchi et al. (2002) proposed that reactivation of faults from the main phase of extension could have melted an enriched source (possibly an extinct mantle plume) in the second phase to produce observed geochemical trends. Figure from Huerta and Harry (2007), showing the modelled evolution of the WARS. The crust to the West Antarctic side becomes cooler and more rigid over time, leading to concentrated rifting next to East Antarctica. Heuret, A., Lallemand, S., 2005. Plate motions, slab dynamics and back-arc deformation: Physics of the Earth and Planetary Interiors, 149 (1), 31-51. Huerta, A.D., Harry, D.L. , 2007. The transition from diffuse to focused extension: Modeled evolution of the West Antarctic Rift system. Earth and Planetary Science Letters 255 (1), 133-147. Lawver, L.A., Sloan, B.J., Barker, D., Ghidella, M., Von Herzen, R., Keller, R.A., Klinkhammer, G.P., Chin, C.S., 1996. Distributed, active extension in Bransfield Basin, Antarctic Peninsula: evidence from multibeam bathymetry. GSA Today 6 (11), 1-6. Leat, P.T., Livermore, R.A., Millar, I. L., Pearce, J.A., 2000. Magma supply in back-arc spreading centre segment E2, East Scotia Ridge. Journal of Petrology 41 (6), 845-866. Rocchi, S., Pietro A., D'Orazio, M., Tonarini, S., Wijbrans, R., Di Vincenzo, G., 2002. 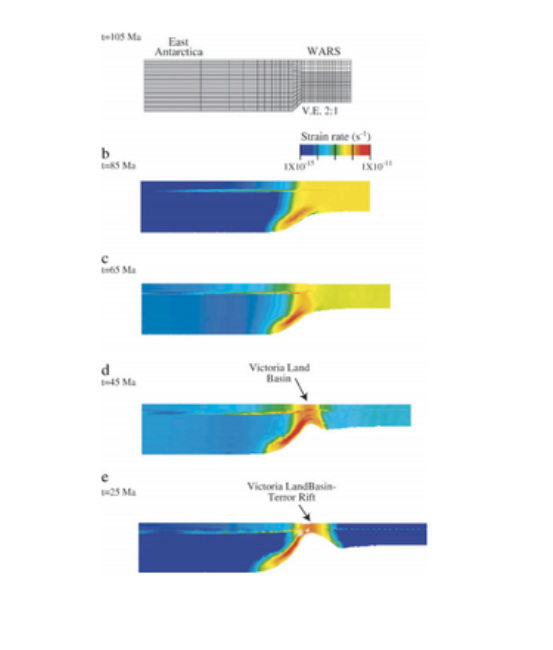 Cenozoic magmatism in the western Ross Embayment: Role of mantle plume versus plate dynamics in the development of the West Antarctic Rift System. 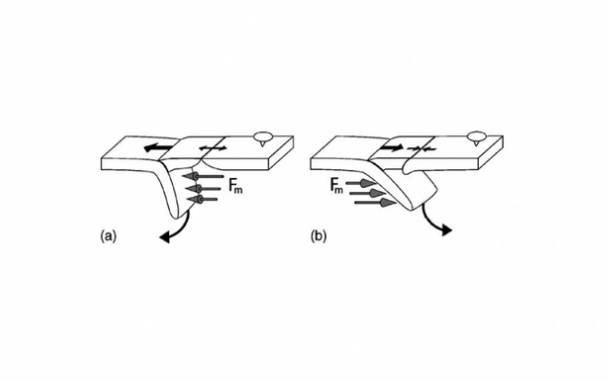 Journal of Geophysical Research: Solid Earth (1978–2012), 107 (B9), ECV-5.